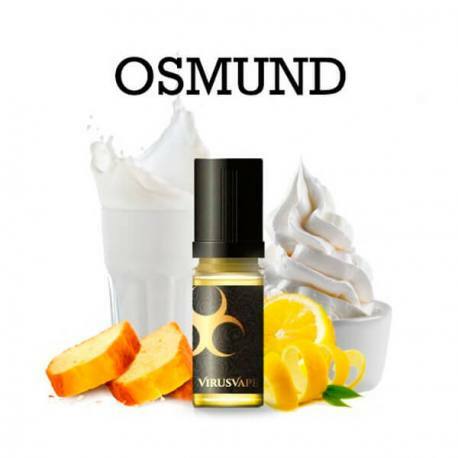 The concentrated Osmund by Virus Vape is a (Pound Cake) Four Quarter Lemon and Creamed Milk Cake. Advised Dosage: Between 10 and 20% and 15 days of Stepping. 10ml Plastic Bottle. Concentrated aromas must be diluted in the base. Do not vape the aroma directly. Complex and Carefully Measured Recipes ! Concentrated Aromas By Virus Vape, ready to use for preparing your DIY e-liquids. The range Virus Vape offers different complexed and carefully measured recipes for successful DIY e-liquids. The aromas Virus Vape are made in France. As a % and therefore in millilitres. Note that 1 ml of aroma is the equivalent of 30 drops. If you need to put 5% of aroma in a base, you therefore need 5 ml for 100 ml, so 0.5 ml of aroma or 15 drops for 10 ml of base. Composition: Nautral aromas and Food Flavourings. 10 ml plastic bottle with a rotating ring, child security, sécurité enfant, visually impaired triangle on the cap, composition, DLUO, Lot number. Never skip the maturation stage. To shorten the waiting period, you can add 1 or 2 drops of white vinegar to the formulation or leave the bottle "open" for a few hours a day and shaking it from time to time to encourage oxidation. Très agréablement surpris, même avec un faible temps de steep, je recommande!! "Vraiment très bon à reprendre"
"En steep pour le moment mais il sent déjà très bon"
"Citron assez chimique et pas de goût de cake ou autre gâteau.... Sinon reste vapable quand même."